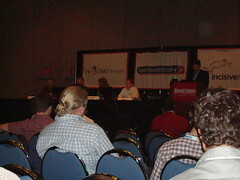 In this session on Day 3 of SES San Jose 2007, there were no presentations. The floor was open to all questions anyone had on links and link building and how they affect PageRank and their importance in organic SEO. There were many questions asked, and even more great answers from the panel consisting of Mike Grehan (“My name is Mike Grehan, and I do links.”), Debra O’Neil-Mastaler (Link Building Chick), Jim Boykin and Greg Boser (“The White Hat Link Builder”), with Danny Sullivan moderating. Below, I thought I’d highlight the some of the questions and answers I thought were most interesting. 1. Are there any implications or problems with run-of-site links? If they are purchased, it’s like putting a big red bullseye on your forehead. If they aren’t purchased, they are in the footer or a sidebar, which don’t carry as much weight as in the body of the site content. 2. Apparently Google is now penalizing for paid links. What is the penalty? You have to be really bad to get banned from Google. But usually the penalty is Google tries not to count that site or those links. This will keep your site out of the index and will reduce your site rankings and, consequently, your website traffic. Also, make sure you stay out of those areas that are “sponsored links”, and work harder to get the couple great, reputable links that will build PageRank and your sites reputation. 3. With Google Universal Search becoming so popular, what does that mean for those who want just more links and more links and more links? there is a tremendous amount of popularity out there with universal search with images, video, news, map and blog results coming up as well as regular search results. it’s just another incentive to get that quality content on your site. 4. Internal linking: after Google acquired YouTube, YouTube started using no follows on internal links even to help pages and about pages. what does the panel think about internal nofollow links? Specifically do you think that by doing these internal nofollow links, can you control the flow of links into a certain page? Danny – Nofollow is best described as a link condom. the idea is you can touch another site with a link without actually touching the site, especially if you are concerned if it is a “bad neighborhood” link network, because you cant tell what a bad neighborhood is just by looking. if you are concerned, use a nofollow link. it’s safer for your reputation. 5. What are you best efforts for getting links? Mike – Links are not one size fits all. With some b2b businesses, it’s good to use pr-type tactics. One thing I’ve heard about links is figuring out what your content needs to do for your audience and what content you still need to create for your audience. sometimes you just need to create a great tool or great content for your audience. Find out what kind of content would your audience like to see. If you are a mortgage site, maybe a mortgage calculator on your site would draw people in. Jim – What I’ve seen that works is finding good resources yourself. Don’t go through networks or places that are openly saying “we have resources to make your life easier!” Find real resources yourself, write those people a personal letter, prove that you’ve been to that site, and say why your resource would benefit their site. Debra – Every site is different, every link is competitive. Have your client join associations for their vertical industry, and then use the resources available within the association. So many people belong to these associations and the lists are already there. As long as you have something to offer them and a reason to give the link, places will link to you. Greg – Blogging is hard. It gives you links but maybe they aren’t the best links to increase your website reputation and PageRank. I’m not huge into social media. However, anything widget-based that you can give away is cool, but figure out the core phrases you are trying to rank for and figure out how to best link for those and your website and your industry.